This part – 2 is a Continuation of my Blog post earlier. In this part we are sharing next 15 questions and answers about Outplacement in India. 16. May I know how this outplacement program is provide coaching and psychological support to assist individual to overcome this trauma of job loss? And what kinds of programs are there which may be best used to serve these individuals? GR: Choosing a right coach is a big task. The main ingredient of outplacement is coaching. In this case coaching is given in the context of the Career Transition during redundancies or business closure etc.,. The coach who understands the job market with specific to the Industry and the job roles etc., who has an ability to help the coachee in a right direction to achieve his/her goals. 17. Can you share role of union in executing outplacement activity? GR: Outplacement is a good tool as part of the union negotiations and can reduce the intensity of discontentment during the process. There are many examples outside but India I am yet to experience one personally. 18. Is there any organization in India which has or considers outplacement as a separate function? GR: Not yet. It is an integral part of HR. Purchase department helps in managing the vendor relationship in association with HR. The business owner/CEO takes these two functions into confidence along with their Leadership Team to execute such Outplacement activities. 19. Is there any relationship between cross skill training & outplacement? GR: Both are interlinked. During the outplacement activity we help identify the coachee to identify the skills and reusable skills also upgrade skills for better positioning. Training & Upgrading on skills on various requirements is key during the process. 20. Which are the top vendors which help in outplacement (or) Pioneers in Outplacement? GR: Worldwide three main companies compete: Career Star Group. www.careerstargroup.com (Where Husys is associated), Addecco-LHH, Manpower-Right Management. Husys is the only company in India trying to share as much knowledge with HR Fraternity through various forums formally. We had the first program in Hyderabad with about 125 people and the same has been addressed by Mr. Owen Morgan from Penna Plc. UK. 21. Is outplacement voluntary? Or is it decided by the organization. GR: Outplacement is optional during any transition provided to the employee as part of management decision. More as goodwill. But redundancy is a function of business and not a choice of individual. 22. Which type of industry using outplacement services mostly? GR: Worldover most of the organisations appreciate and make Outplacement as part of the business. In India the metrics are used internally by companies but as much information is not shared outside. So we don't have much comparison as of now. In Our experience we did in Pharma, Internet based, BPO, Manufacturing & Financial Services. 23. What are some of the best industry practices that one can follow? GR: I would like to share the stages of Individual during the Outplacement. This is more relevant to understand and support during these phases to the effected employee. GR: various levels of support need to be provided based on the level of people and the complexity of job and external job market. GR: A clear process understanding on Outplacement and the depth of impact would help build a better outcome. 24. What is time frame is being followed for completing the whole process for Outplacement? 25. One of challenges in outplacement cases is dealing with salary n level / designation aspirations of the coachee. Request some insights? GR: Usually the work begins in that direction from planning to apply position to negotiations with companies. Evaluating carefully the opportunities and whether they fit into the progression plan that coachee had etc., would determine the outcome. The support of coach to take that right steps would define the outcome. Eg. Not doing salary or level negotiations with HR but along with the Hiring Manager. Sometimes applying to only positions which are as part of the desired list. In some cases if we feel the job market is not at the bench mark, we need to communicate to the coachee - they would not accept initially but after some time when realities are seen they would accept. Also there was a case where from large company the coachee moved to smaller company but in a better position. However, the compensation was in equity of the company which is a huge plus. 26. I meant to ask outplacement should be considered at top level or mid-level too? GR: Outplacement can be considered for any levels in the organization. However, The depth and intensity has to be different from each levels. This is because the job market is more easy at lower levels to tough for senior levels. Usually, the program can be 1-3 months for lower levels, 3-6 months for Mid/Senior Levels and in cases of CXO levels advised 6 months to 18 months. 27. What % outplacement is happening across industries. How it will impact HR professionals? GR: We don’t have a specific inputs on this question. However, There are formal and informal ways of handling Outplacement based on the HR experts available inside the company. I am sharing a quick video of one of our partner who shared about Outplacement. This summaries basis outline. Usually the expectation of Outplacement (please do not focus on word placement) is to Help individuals in their career transition from current into future. Its in other words also refered as Career Transition Support for employees. 28. I want to know your thoughts on how do you garner buy in from management for concept like outplacement when placement itself at times is a challenge? GR: Outplacement has various benefits to organization highlighting those would be of use when you discuss with management. Outplacement is a good way to show that YOUR organization cares for people even in difficult times of organization. Also you are not impacting much to individuals who may choose to comeback with enhanced skills in future. Also good attracting tool for people to join your organization. They don't have a fear of losing a job but you are there to help. a. In your career have you performed outplacement for blue collar employees? b. Any experience of outplacement in Pharma org? GR: a. We have not done the Outplacement for specific to Blue Collar workers in last 2 years. However, we would modify the methodology to support them. However, we have handled many junior level positions in India. b. We have done for a large Phama gaint for about 168 people. We have done more than 500 outplacements so far in last two years. Some more we did in groups which may be more in number at lower level of teams. 30. What happens in case employee needs to exit much before his outplacement happens? Does this 1-3month extend post his exit from the organization? How does this happen in the industry? GR: The exit could be related to got an opportunity for a job. Change in plans for job hunt or for any personal reasons. Also the reasons which are not in control of the organization. Also it’s a choice and can be successful with the participation and interest of the coachee. We shall release the next 15 questions & answers soon. Please read and comment to improve the experience of this blog for users. Husys - HR Function Management Company (www.husys.net) pioneered the HR Function Management in India since 2002. Husys strive to help in managing to stream line the change that organizations go through during their growth phase. Husys addresses the key Human related issues to support organizational Growth. We integrate the Hiring, Induction, Performance Measurement, Policies, Employee Bonding and Development. 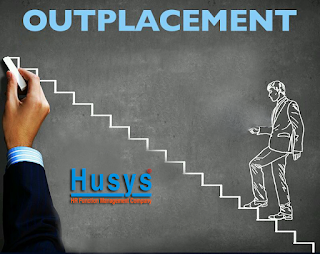 Husys is part of the Global network "Career Star Group" specialized in delivering Outplacement/Career Transition Services in India. Reach us for any support in HR Consulting / Outsourcing / Technology Management Solutions. Husys Consulting Limited is the first and only HR Company to be listed on Stock Exchanges in India. Husys is now listed on the National Stock Exchange - EMERGE - ITP platform.